This post has been long overdue & today I just had to sit down & complete it, to share it with all of you! I have watched reviews & skincare videos which include Soap & Glory products & these got me very curious about the brand. I felt like if not anything else, I must definitely pick up something from Soap & Glory on my first trip to Sephora this year (ahem...in August). Packaging : The packaging is totally adorable & vintage-y! Extremely girly, this packaging is sure to catch any shopaholic's roving eye ;-) The products come tucked safely into a thin plastic moulding which has 'SG' embossed all over it. This gorgeous little gift-box contains small travel-sized versions of Soap & Glory's bestselling products. Let's go through them one by one...!! This body mist has found a permanent place on the side-table in our living room. Why? Cuz it's spray mechanism comes in handy when I have exactly 0.256 seconds to moisturize dry elbows, knees, spots on a 3.5yr old hurricane!! Also, the product doesn't really come out as a mist, it sprays out but settles on the skin like any other moisturizer & has to be blended into the skin with your hands. Having said that, it's quite easily blend-able into the skin & the skin feels nice & soft after using this. Girligo might have a 'girly' name but is much loved by my lil macho man..!! I love the fact that I got this in a small tub that's totally travel-friendly :-) I have used it once every week from the time I have bought it. It's a yummy-smelling scrub with the original Soap & Glory scent. The sugar-like granules are tough but not harsh on the skin. I recommend mixing the scrub with your finger once before using it, in fact I'd say mix it every time before you use it; the oily base tends to separate and come up once the tub is left unused for some time :-) (see pic). This doesn't hamper the product in anyway but mixing it once before application, will ensure all the ingredients combine to give you a great effect!! 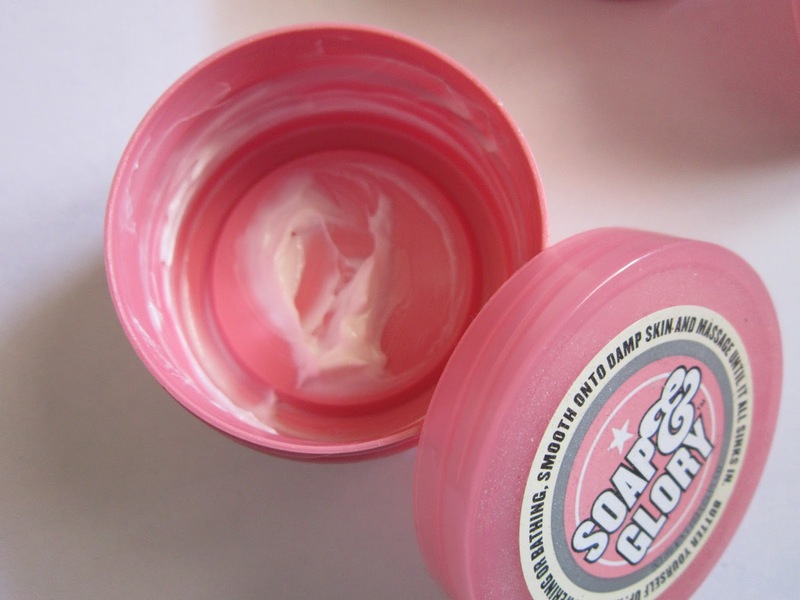 Soap & Glory is a brand that isn't easily available in India. So the next time, you spot Soap & Glory, be sure to pick up at least one product to try it out! I got the CLEAN ON ME Creamy Shower Gel for my Sis-In-Law - V & highly recommend that you get your hands on that one first. It'll surely make you want to get more from this brand. I apologize for the delay once again...this post should have come in Oct itself & it didn't :-) Hope you liked this post.. do leave me your comments in the 'comments section' below. Have you tried any Soap & Glory products before? Tell me all about them..!! Read so many great reviews on the flake away scrub. Can't wait to try it out. I have always wanted to try out Soap and Glory, but, well, the availability... I think kits like these are the best way to explore a brand. Shall keep an eye on this kit for sure.